On the 25th of January 2018, Wancher launched the Kickstarter project ‘The Dream Pen‘, with three options, True Ebonite, True Urushi, and True Maki-E. The launch was accompanied by a series of very positive reviews by various bloggers and vbloggers, resulting in a heavy subscription, including from yours truly (I blame you Figboot). A year and a bit later mine arrived and has been used for the last three weeks. 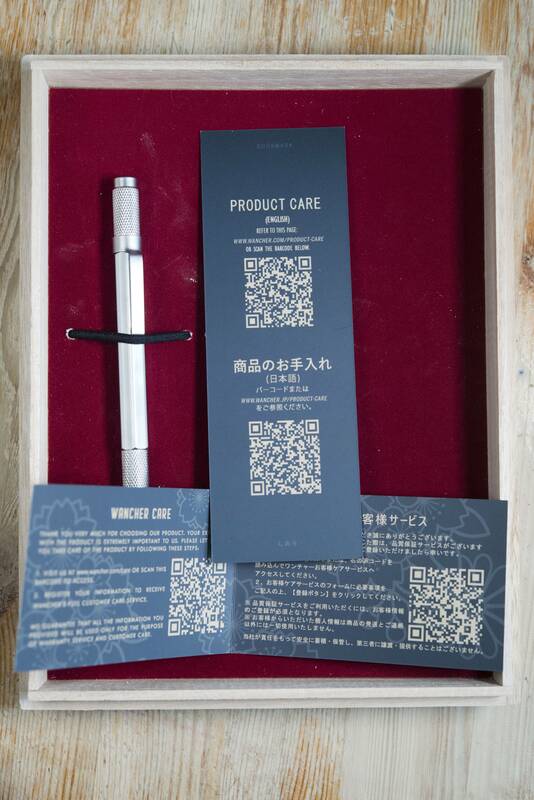 While Taizo Okagaki may have been reselling pens on eBay through Engeika, and limited edition re-bodied (primarily Sailor) pens and other related paraphernalia through Wancher Pens, this was a move to produce his own luxury pens from the ground up. 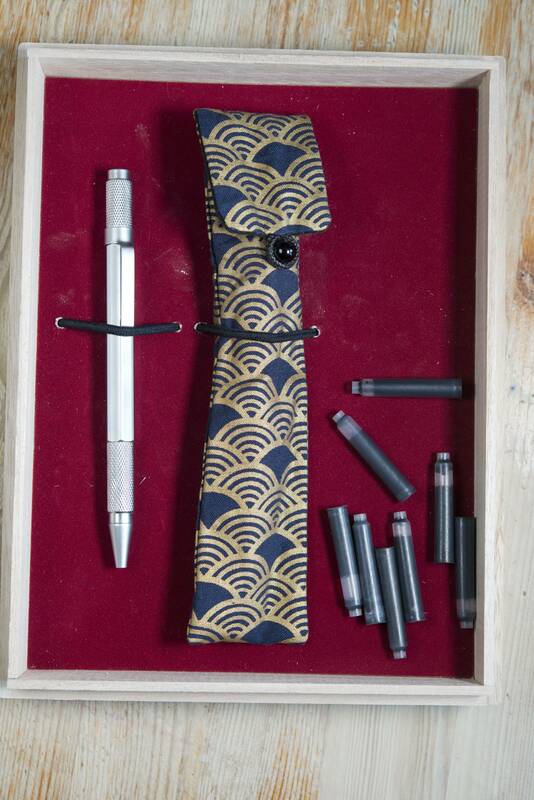 The aim was to use Japanese craftsmen using traditional techniques, though the materials would be sourced else where (the urushi lacquer was from Vietnam and the nibs from Germany). 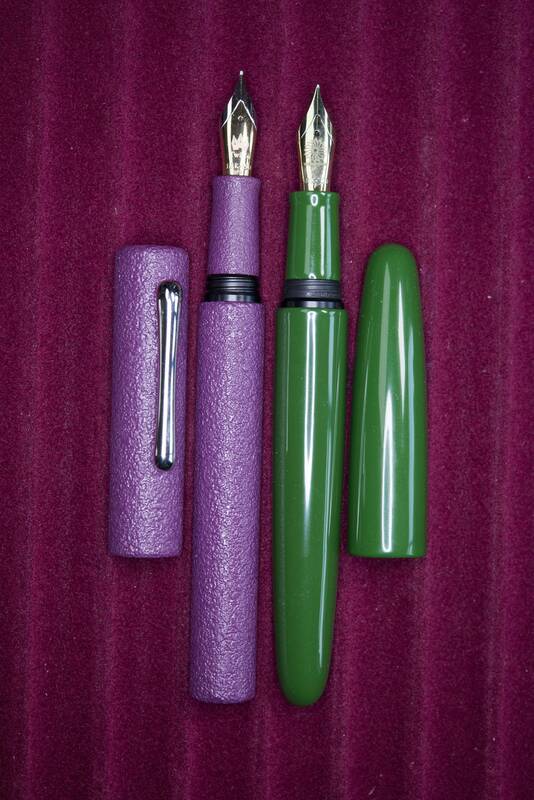 All three pens share the same classic cigar shaped ebonite body with no clip or other external adornments. The First Urushi pen was also meant to provide a entry in to the world of urushi/maki-e/chinkin, with a pen at a lower cost point than available else where (for Japanese work). 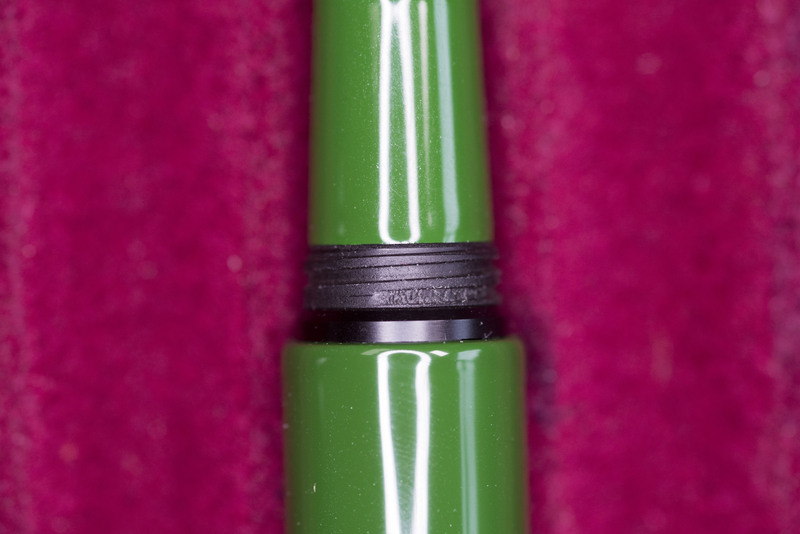 There were various colour options for the True Urushi and I went for the green/midori finish. 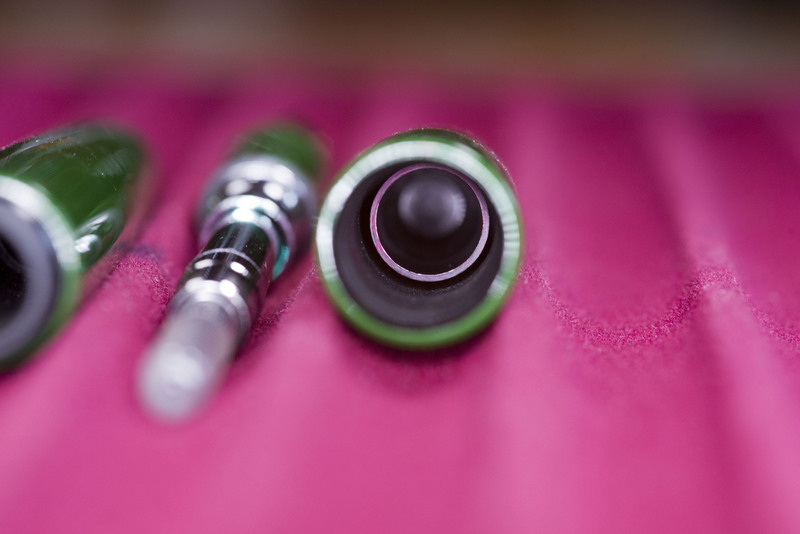 The pen, through Kickstarter was $350, a big discount on the $450 retail price. 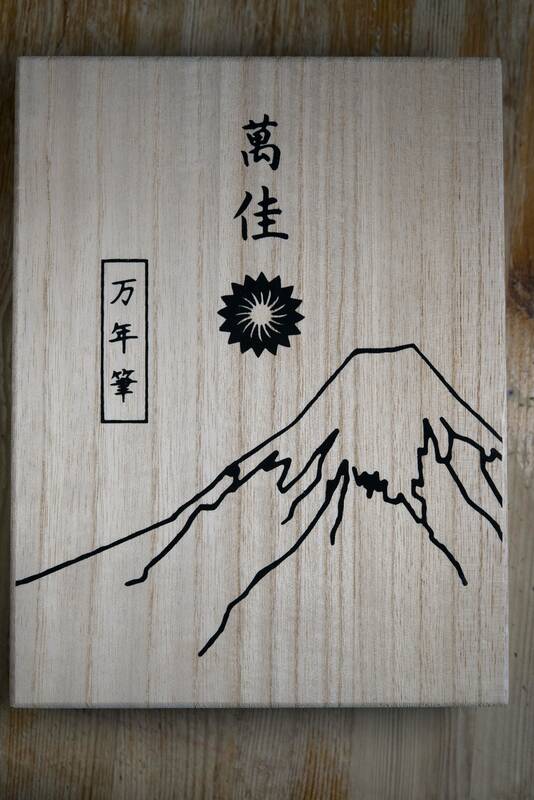 Keeping with tradition, the pen came in a paulownia wooden box with Japanese text (if some one can tell me what else it says aside from Wancher Pens, I will update this part) and a picture of Mount Fuji stamped on the front. 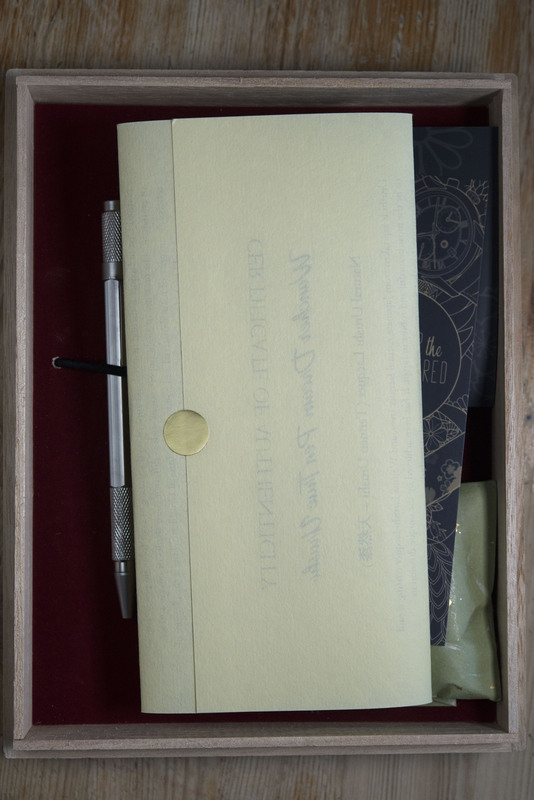 Opening the tight closing box and on removing a sealed letter and two card care guides you are left with the pen in a silk kimono, an envelope containing 8-10 ink cartridges, and a gift of a steel ballpoint pen (this quite possibly is just for Kickstarter orders). 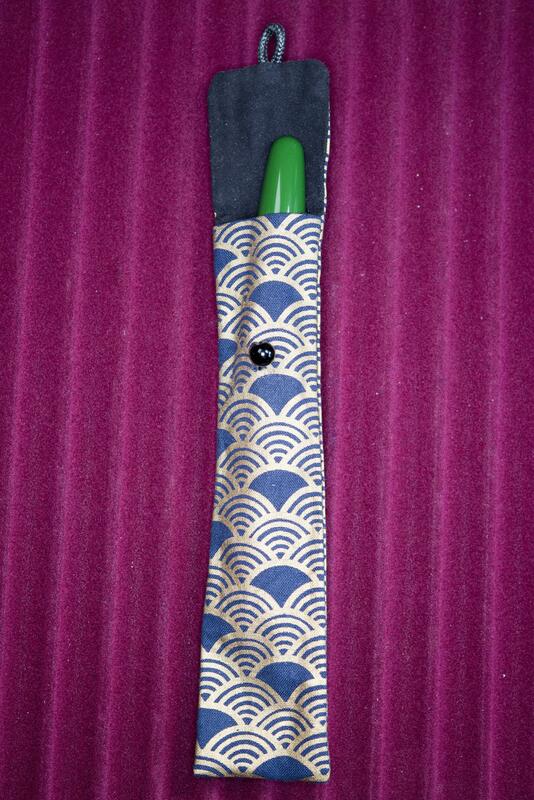 The kimono is secured by a hoop over a round button and is lined with a soft velvet/felt like material. The only concern I have is the knot tying the button on to the sleeve is not between the silk and felt, but on the inside, and it feels stiff. Having said that, urushi lacquer is tough and I’ve seen no evidence of marking on the pen, despite using the kimono to keep the pen in when not in use, even with being kept secure in the top of my pen case, as can be seen on the first picture of my last daily carry post. A quick note on the sealed letter included with the pen. It provides background information on urushi lacquer, and also on the Japanese concept of Wabi-Sabi (which I personally think is better considered as ‘The Perfection of Imperfection”) and why no two pens will be identical. While it was not new information for me I did like the letter and felt it was a very good touch. Also it would provide good, easy to understand, background information for those new to the material. The letter also includes details of the group who did the lacquer work. 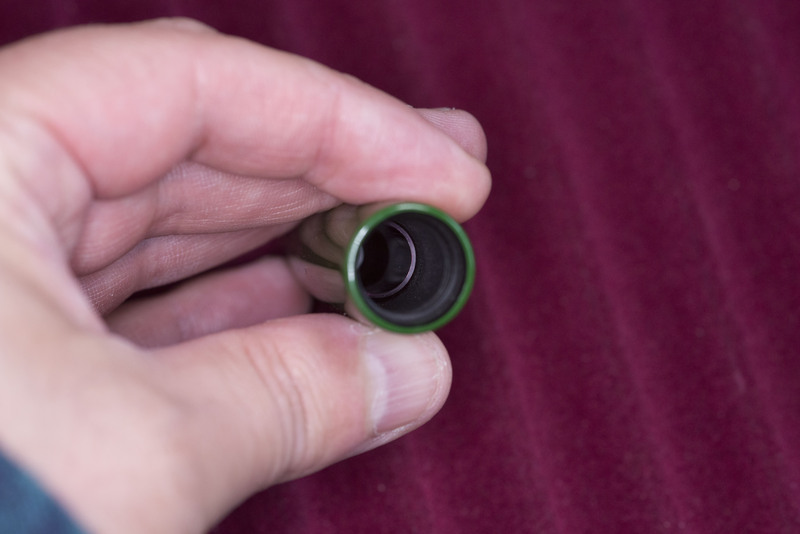 The pen, as previously mentioned, is the classic cigar shape with no external adornments. 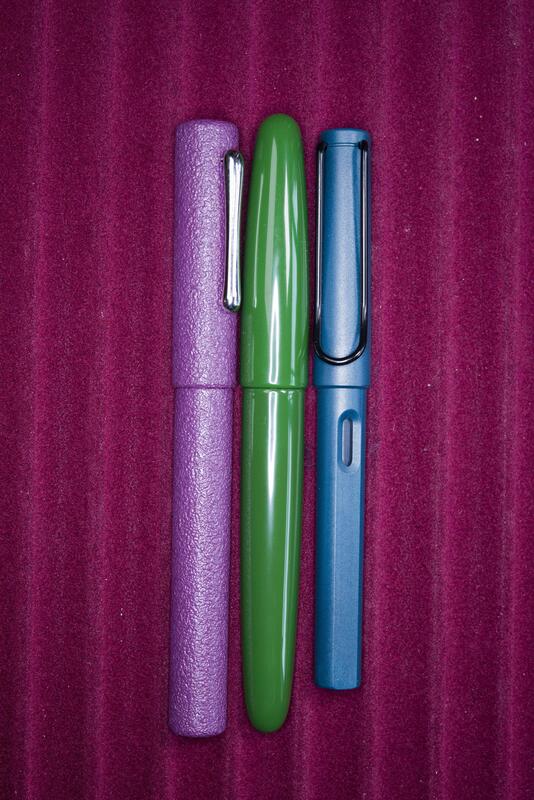 Size wise it is both taller and wider than the benchmark Lamy Safari. 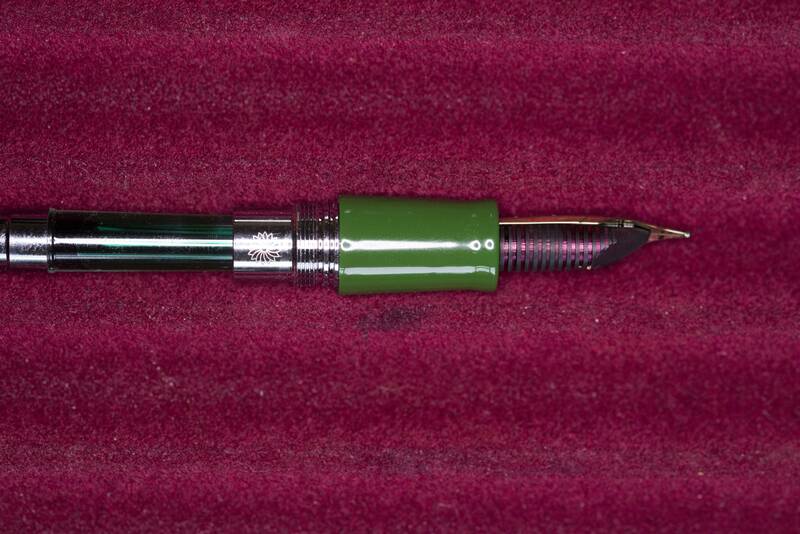 The third pen has been included here for a good reason, for while made for and sold by TwiCo (part owned by John Twiss) I believe that it was also made/sourced through Wancher Pens – on the same webpage the two demonstrators are Wancher Crystal pens (a low cost fun pen also produced by Wancher). The similarities are not just in the way the threads are cut, the converter inside, but also the feel and strength of the sprung inner cap. 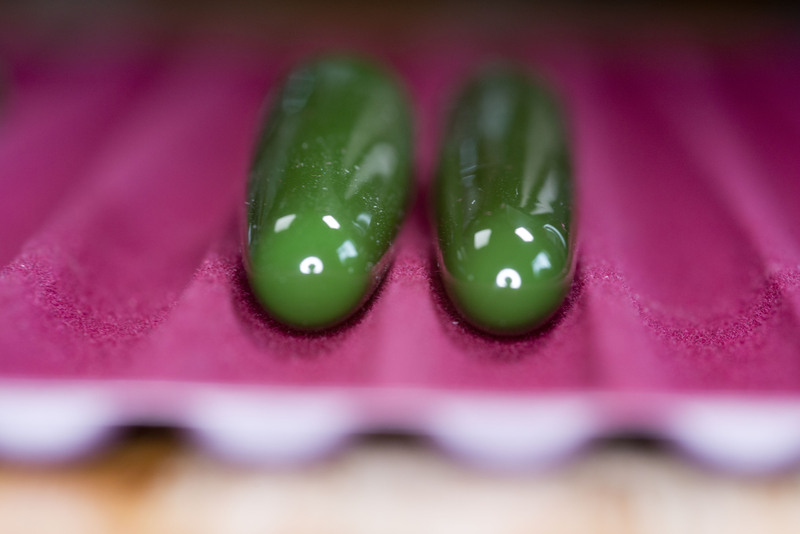 It should be noted though, that the TwiCo Urushi Ishimeji-Murasaki has a MRP of £600/$785, so considerably more. 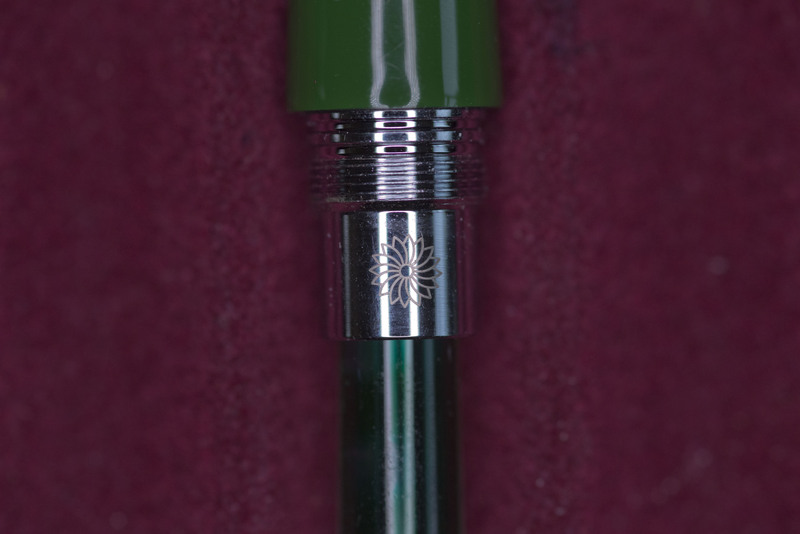 The Pen has ebonite threads for capping, and the inner cap is sprung, providing good protection from ink evaporation. If it is the same system as on my TwiCo sourced pen then it works well. The screw/threads for the grip and barrel are stainless steel – which does take away some of the worry about cracking or stress in this area. There is a short tube beyond the threads on which the Wancher emblem is laser engraved. 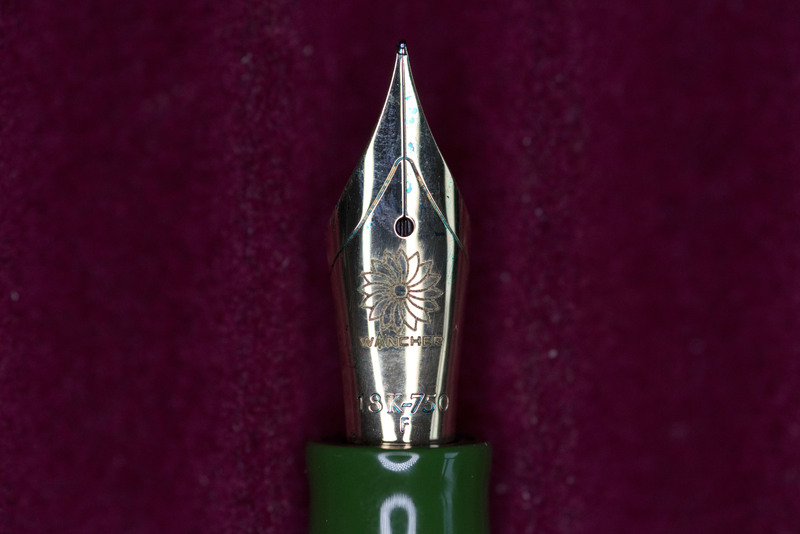 The ebonite pen came with a JoWo steel nib, with the option to upgrade it to gold. For the Urushi and Maki-E pens the nib was gold as standard and came with the options, not only of size, but also between 14k and 18k and nib finishes. I went with a fine 18k plain gold nib. Controversially Wancher apparently failed to get/get enough rose coloured nibs and initially just told backers they would get a Wancher nib instead (a new venture). Some people were obviously unhappy with not being given a choice, but it appears that on contacting Okagaki-san directly through the website, backers were able to change this. The nib was also meant to come without a logo (unlike the retail pens), however they have arrived with the Wancher logo on them. Looking closely this is laser engraved, not stamped (like the pattern and gold quality details), and this does provide a slightly rough edge if you move your finger or a fine cleaning cloth over it. For me this is not an issue, but I know some one else who was unhappy about this as he ripped a microfibre cloth on the pattern. 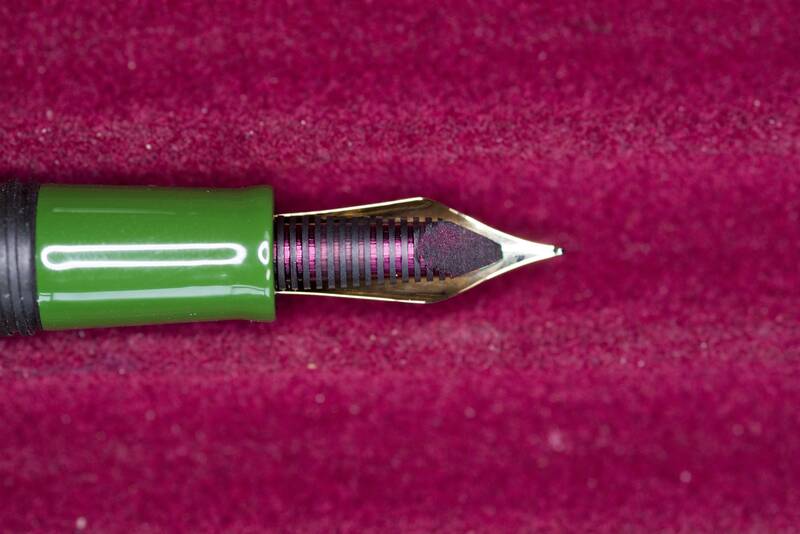 The feed is ebonite and provides a decent flow (as far as I can tell – as a fine nib is hardly going to tax it. The writing experience itself is very pleasant. It writes and feels, unsurprisingly, like a nicely tuned 18k gold JoWo nib. 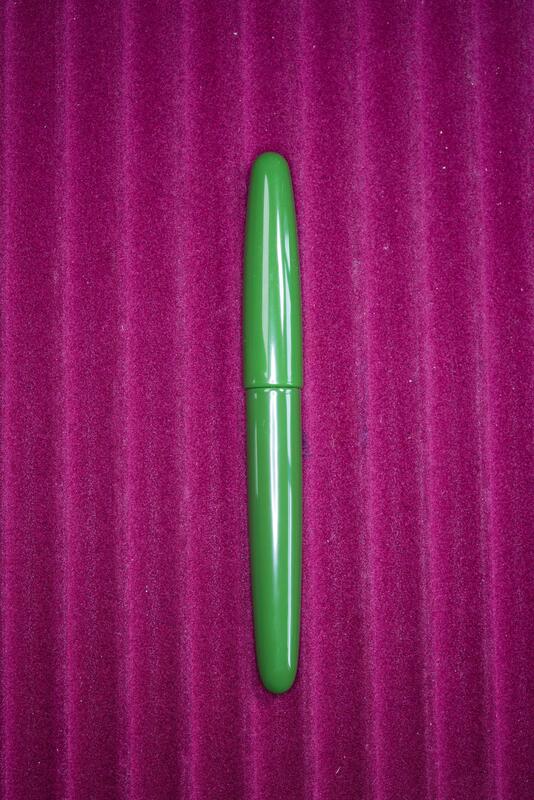 The pen is well balanced and it’s lightness means long writing sessions are not a problem. As can be seen from the pictures directly above, the grip is of a shorter size before the threads. 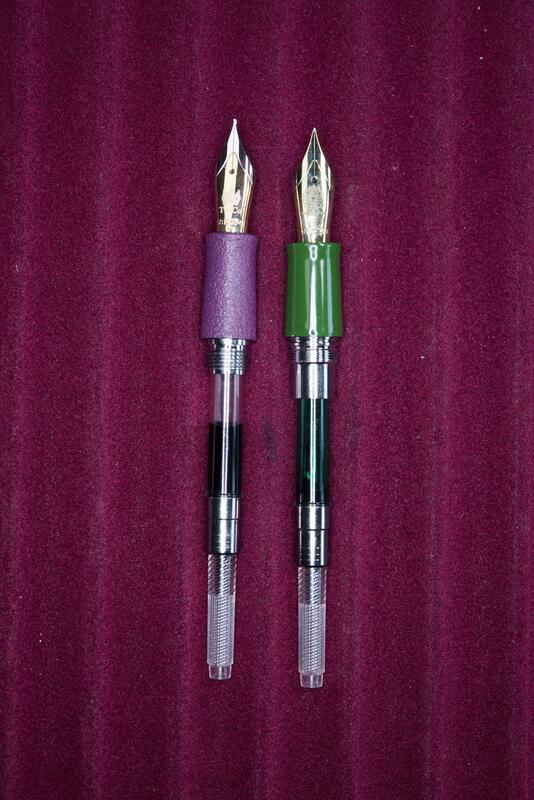 These are wide and shallow, resulting in unobtrusive and comfortable larger area by which to hold the pen. 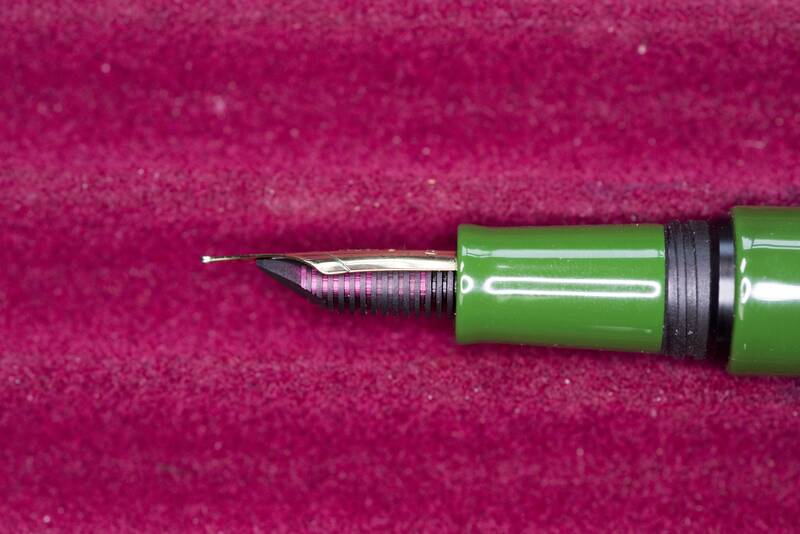 From the threads the grip is angled inwards until just before the nib end, at which point it angles sharply outwards. I actually find I hold the pen slightly further back, put pushing my fingers forwards I found it provided a comfortable stop. So am I glad I went for the campaign and got the pen. Yes is the simple answer. It is not my first urushi pen, and probably will not be my last, however it is a very nicely made writing instrument, which is good value for money at the Kickstarter price. Retail I still think it is a good pen, though with other lower end urushi lacquered pens appearing it is not as good a value as when first conceived. 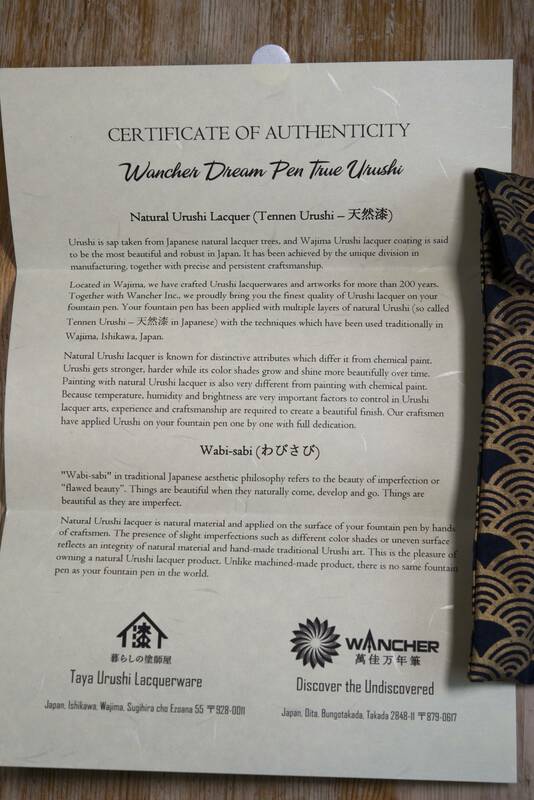 I like the way Wancher have been able to use traditional Japanese artists and craftsmen, as well as techniques by cleverly cutting costs with material sourcing. It will be interesting to see if they can maintain the $450 price once they start using their own nibs, and how these will compare with JoWo. 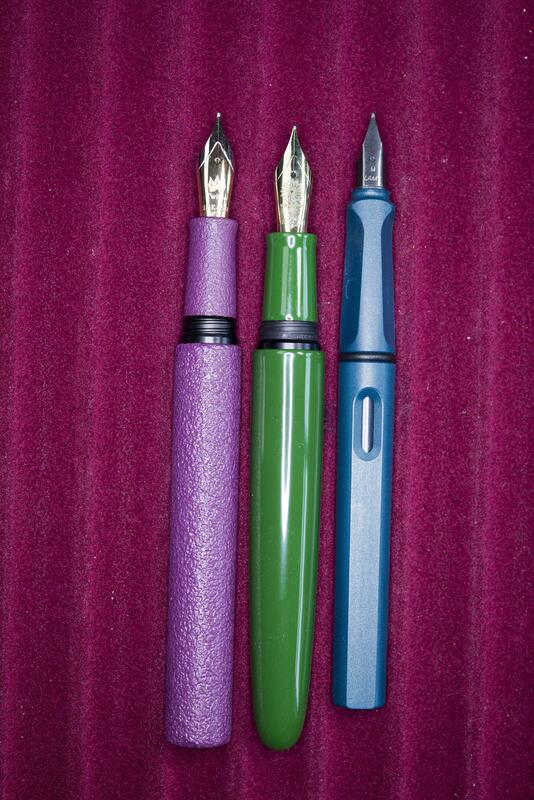 A recent comparison of an early nib by Figboot proved favourable. So am I still using the pen. At present yes, but now this review is complete it will probably become an occasional use implement. As I said, it is good, but like most cigar shaped pens I feel it lacks character, or rather enough to keep me interested (might have been a little different if I had gone for the aki-temanuri finish). It should be noted that if I were to considerably reduce the size of my collection, this may change. 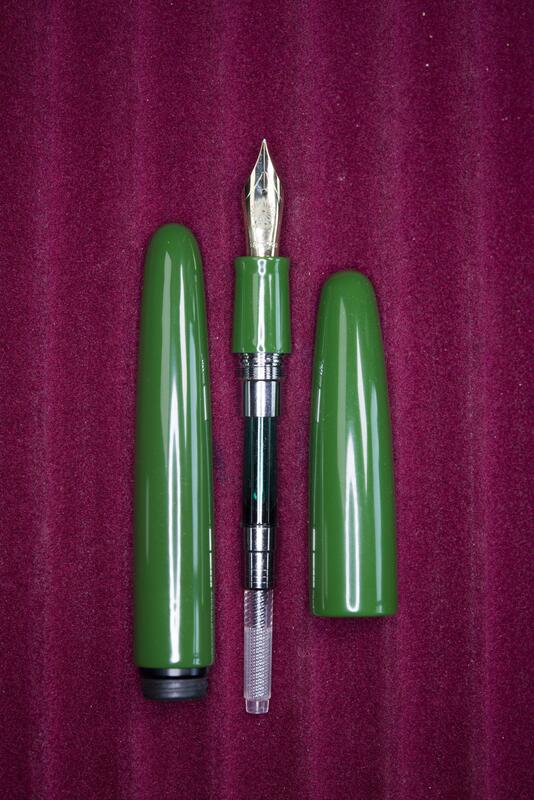 It might also be interesting to try a Wancher nib in mine once they are available as the initial pre-production reviews infer they are softer and have more bounce than the JoWo ones. 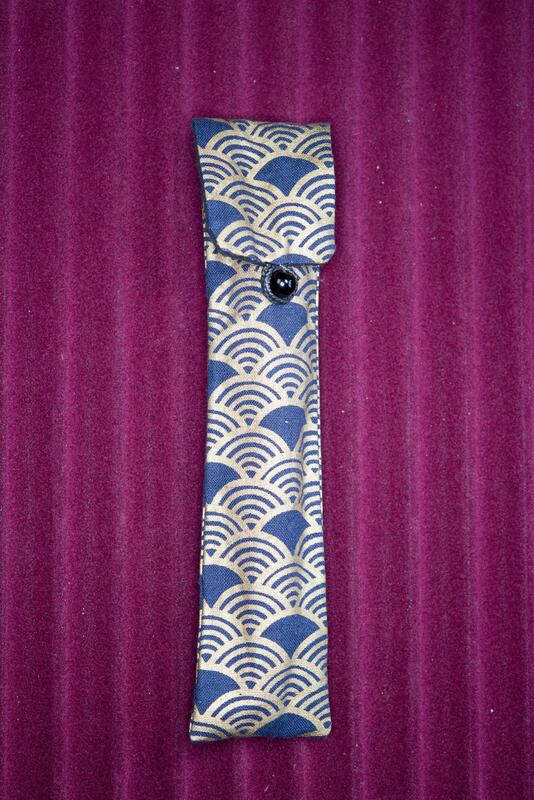 No clip (for those who need one – not a con for me). Writing sample – on rhodia paper. 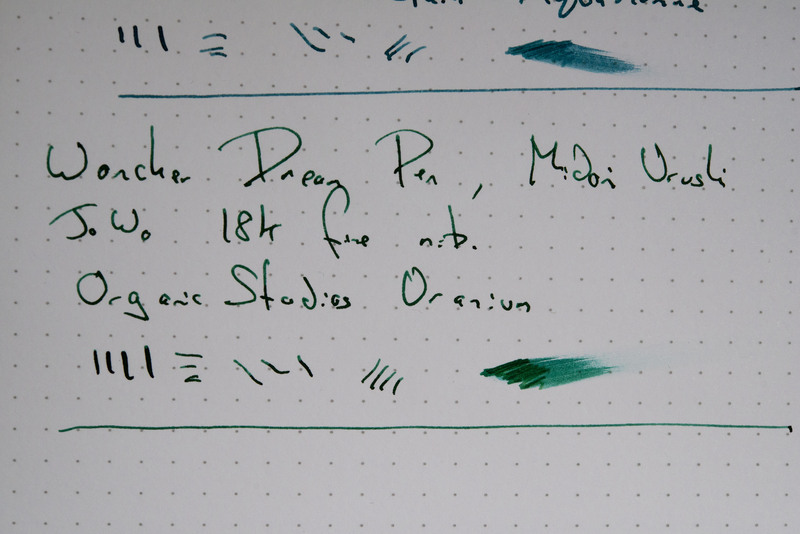 Ink is Organic Studios Uranium – I have a sample I was given and the colour matches the pen rather nicely. Also, unlike other OS inks, there’s little sheen and what there is nicely subtle.